Am I a Dance Mom? I think of myself as a generic, run-of-the-mill mom. Like many parents who benignly neglect their children, my kids spend hours in front of the computer searching God-knows-what. Apparently my 10-year-old daughter is a fan of the show “Dance Moms.” I have never seen the show. Don’t get me wrong – I enjoy watching television. Binge-watching shows with my husband is a favorite activity. For some reason, reality shows hold no allure for me. Judging by the number of them on television, I gather I am in the minority. My daughter is a big fan of this reality, dance mom show. I was vaguely aware that it seemed to spark an interest in dance in her as I saw her twirling around the house in my peripheral vision. She wanted to take a dance class, so I called a local dance studio. Ignorant of all things dance, I didn’t have the words to make this request so I had to speak in the universal language of television. “My daughter doesn’t know how to dance, has never taken a dance class, but she’s a big fan of ‘Dance Moms.’ Which class would you recommend for her?” I asked. This clearly was not their first Dance Mom inspired inquiry. The woman on the phone totally got it and pointed my daughter towards Broadway Jazz. She loves it. She happily attends her weekly class and always enjoys it. I thought she looked so cute, picking out appropriate clothes to wear each week, doing her hair up into an intricate bun – sometimes with accessories on it. Then she casually mentioned that the cast of Dance Moms was coming to town. She reluctantly asked if maybe she could go – she said they would even be teaching a dance class. Her reluctance showed that my daughter knows me well. Surely I wouldn’t agree to waste money and time on something so frivolous, would I? I mentioned it to my husband, who was on the same page as me. Still, the 10-year-old gently and systematically kept asking, eventually showing me the website where I could find all of the information. What to do? I sought the advice of a friend who is the mom of my daughter’s best friend. She was enthusiastic and thought her daughter would love it as well. Really? She would consider it? Would I? Could I? “You talk about making memories. This would definitely be an experience your daughter would remember,” she said. So I surprised my daughter, and myself, by buying tickets and planning to attend this event. It included meeting the girls from the show, having your picture taken with them, and taking a class taught by a teacher from the show. Four hours of fun. She was so excited. It wasn’t as bad as I thought. I tried to keep the curmudgeon in me in check and mustered up excitement and enthusiasm for my child. The event was well-organized and not a complete mob scene. The mother-attendees were a mix of typical suburban moms, like myself, and what appeared to me to be true dance moms. There were many adorable girls, appropriately dressed, and then there were others who reminded me of Jon Benet Ramsey. I realized where my daughter got the bun idea from. What I thought was darling and adorable when she created it at home, suddenly looked pedestrian in a sea full of buns. The dance girls seemed like typical girls, though a little precocious. “Please turn off your flash when you take pictures…it hurts our eyes,” they requested. They seemed bored with the endless picture-taking. Who wouldn’t be? I only met one mom from the show – a school principal I’m told. She seemed normal and nice. The other Dance Moms were busy selling merchandise so I did not interact with them. My friend and I agreed there would be no merchandise purchases; the memories would have to be made through the experience and pictures of the day. Our girls were so excited because they ran into some of the girls from the show in the bathroom! Can you imagine? They use the bathroom too! The dance class was cute. Our girls were on the younger and less experienced side, so they happily positioned themselves in the back of the room. They warmed up, learned two dances, and got to dance in front of the people from the show. At the end, each of the four girls from the show did a dance routine. On the way home, the girls were chatting about the day. “Did you see why we were so skeptical about it?” I asked. My friend shot me a glance to silence me. I was grateful for the restraint. No need for grumpy old me to be a buzz-kill. They experienced the day through the fresh eyes of children, not through my cynical lens. I am pretty sure my daughter is not going to be a professional dancer and that I am not going to be a dance mom. While I was reluctant to indulge in this activity outside of my comfort zone, I saw how much fun she had. Maybe I’m just a mom who was happy to give her child a fun day she will always remember. 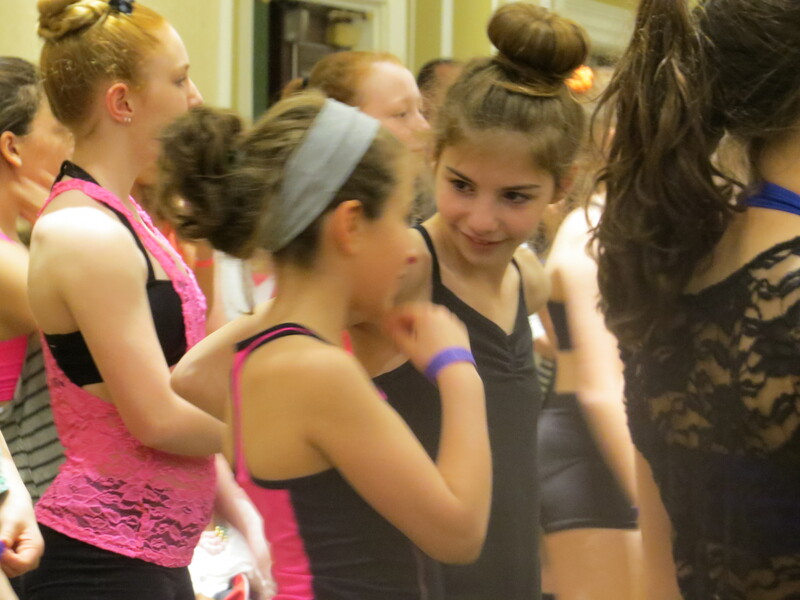 This entry was posted in Family and tagged dance moms, Family, humor, mother, Parenting. Bookmark the permalink. It is so foreign to me that I haven’t made up my mind as to what I think. Apparently, the experience was wholesome enough but I get nervous when little 10 year olds want to look too grownup. Watch very carefully and we shall see. Your writing as usual is excellent and perhaps one course will be enough to get it out of her system. Just a fantastic, real, wonderful story your daughter will cherish so much when she grows up, I think, not only because of the great experience and memory you gave her but because of your wonderful, grounded, honest presence in it.